Amonkhet spoilers keep rolling, and so far, it seems the community’s reaction is muddled. With Invocations having left such a bitter taste in the mouth of many, it seems players are receiving the set a tad more cynically than normal. That’s impressive, considering how cynical Magic players are to begin with. So far, the money card appears to be As Foretold. While the card itself is far too expensive right now to consider, it’s all the things that it does that people are eager about. The rules change I griped about last week hoses split cards, but the free cards like Restore Balance and Living End got a huge boon in that card. That’s just the tip of the iceberg, and once the set is legal, it will be exciting to see what crops up on MODO and beyond. 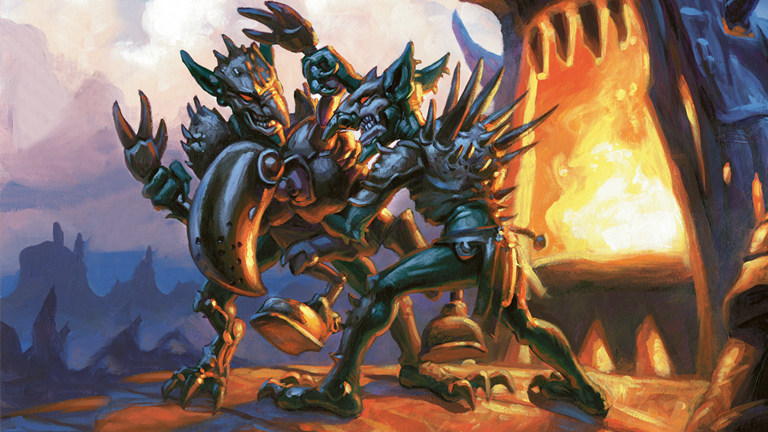 This is probably the first time I’ve talked about Krark-Clan Ironworks (KCI) in this article series, but it isn’t the first time I’ve discussed the card in general. KCI is a long fringe favorite in Modern, solely enabling the Eggs archetype that we’ve seen crop up in various formats. While KCI wasn’t involved in the version of the deck that got banned, it’s been the clear successor to the deck. At a few events both in the meatspace and online it’s managed success, but nothing large enough to push it too far. The recent printing of Breya, Etherium Sculptor jumped it from $4 to $10, and after a month off, it’s back to climbing again. Recently Michael Jacobs, a semi-pro player that’s been on the quieter side of things, tweeted that he’s 18-5 with a new KCI build. This one makes use of Scrap Trawler to create cascading chains of value, and I’m sure all sorts of devious tricks await those who make the effort to dive into the deck. KCI has a current price tag of $10 and there’s very little supply out there. Add to that that it’s already spiked twice before, which means there isn’t a lot of liquid copies left to flood into the market on the back of a price spike. Vegas is in two months, and a lot of players are going to have Modern on the brain. If this particular strain of KCI Eggs takes off, expect the namesake to claim healthily. That these two cards happen to basically have the same price and outcome profile doesn’t mean I’m just being lazy ok.
Nobody was really paying attention to the Modern Classic this weekend. It’s not surprising; it was a Legacy Open, which is one of the few times necrophiliacs can publicly enjoy their vice. If you had made a point of stopping by the Modern results though, you may have noticed that UB Faeries came in not only 3rd, but also 13th. When Fatal Push was spoiled several canny players noted that it could mean big things for the disgraced Lorwyn tribe. With four main deck copies in both lists, it would appear it has had at least a small impact on the deck’s viability. What’s even more interesting is the relative lack of Ancestral Vision, with only two copies in a sideboard between both lists. That means there’s a lot of other room for prices to grow, since there isn’t a playset of a corner $60 mythic capitalizing budget space. Like most cards I discuss, supply on Mistbind Clique is already extremely low. I’m not sure exactly when this will trip, or even if it certainly will, but it’s definitely got the profile and the potential to make brave investors a fair return.